Oil Solutions 100% comprehensive oil clean up, Removes the smell and stain of oil on contact. OS Powder is the Complete solution for remediation & clean-up of fuel, oil, and other hydrocarbon spills. Oil spills on water and hard surfaces are no match for OS Powder. Remember this, Oil Solutions works on any fuel! On any surface! This product is the real deal! Does it sound to good to be true, Buy some. try it! From old oil stains to new oil spills, put us to the test. Regardless of what method your using to clean your oil spills, we guarantee that this product will save you time and money! Put us to the test on your next fuel/hydrocarbon spill! Be a part of the Revolution! Compared to existing methods, like polypropylene booms, absorbent pads or clay, which remain hazardous after use, greater savings and environmental consciousness can be realized in hazardous waste handling and disposal due to the non-hazardous nature of the resulting microencapsulated Oil Solutions residue. Oil Solutions additives reduce the total amount of solid wastes and treat the hazards at the scene instead of just mopping it up, packaging it up, and passing on a risk for someone else to deal with. 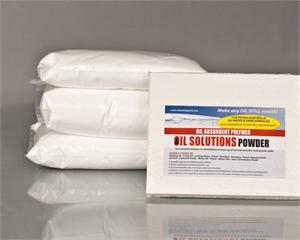 Oil Solutions polymer powder is a unique super-absorbent that can reduce the time and costs associated with remediation and clean-up of a wide variety of fuel, oil, and other hydro-carbon spills on water or on surfaces. While reducing risk, liability, and costs, Oil Solutions Powder provides a safe, simple, and effective means for not just absorption, but microencapsulation of oil spills on water or on any surface. OS Powder requires less product per spill compared to traditional sorbent products. OS Powder remains afloat while other products may float for only a limited time or not float at all. Combined with rapid, effective spill control performance, OS Powder is an extremely cost effective solution. Simply apply the Oil Solutions (OS) polymer powder over the spill area to rapidly absorb and transform the spill into solid clusters, suitable for easy recovery. Hydrocarbons such as crude oil and most fuels will form a solid mat. OS powder requires less product per spill compared to traditional sorbent products. OS Powder remains afloat while other products may float for only a limited time. These attributes, combined with rapid, effective spill control performance, makes OS Powder extremely cost effective. Depending on the application requirements and environmental conditions, OS Powder is typically applied at a rate of 1-2 lbs. per gallon of spilled hydrocarbon.